The (city) square suggests, in the very word, a square or rectangular area within a city, but the architectural practice is far more complicated. The open space, which is called a ‘square’, is, in fact, a collective name for all sorts of man-made plazas, in various forms and sizes, framed inside or outside the city perimeter. The relation between a square and its possible quadralectic origin has, for that very reason, a complex character. It can be stated, regardless of this complexity, that the square represents the ‘open space’ in a communication (between the city and an observer) and therefore seems to point to the ‘First Quadrant’ (in quadralectic terms). This primary impression of the ‘emptiness’ of the city square and its association with the invisible invisibility can be decisive. Most large squares in the world have sculptural decorations and/or monuments. Small plazas feature adjoining houses, churches or palaces, which mark their presence. The initial impression of emptiness has to be reviewed in the process of observation. The interpretation of the plaza in terms of an element of public significance becomes part of a wider communication – guided by the chosen type of division thinking. The Austrian architect and city planner Camillo Sitte (1843 – 1903) placed a particular emphasis on squares (fig. 703). His book ’Der Städtebau nach seinen künstlerischen Grundsätzen’ (City Planning according to Artistic Principles) was written at the close of the nineteenth century (1889) and became a classic in city-planning literature. Fig. 703 – Votive Plaza in Vienna (Austria) by Camillo Sitte, 1909. Sitte’s ‘Raumkunst’ was an analysis of the sequence and complexity of the plazas and streets in ancient towns. The search for the principles of timeless urban building by Sitte seemed, at first, rather archaic, with many references to the ‘good old times’. His book was mended as a protest against the established order of things, at the end of the nineteenth century, and he was eager to state his own, more optimistic point of view. ‘To be convinced that something of value and beauty can still be created today one needs a positive faith in his cause and an enthusiasm for it’ as COLLINS et al (1986; p. 142) put it in their attention to Citte’s book on ‘The Birth of Modern City Planning’. The enclosure was regarded as the most significant component of urban space. Fig. 704 – The Forum of Pompeii was lined on all four sides with public buildings like temples and markets. 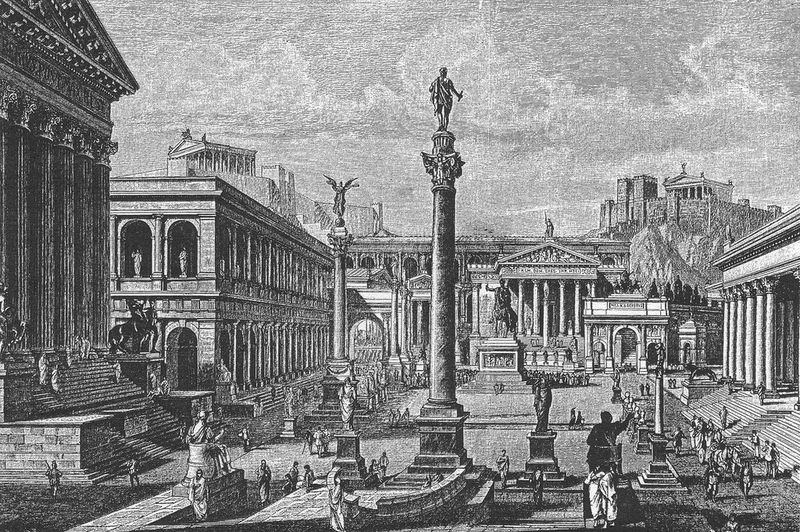 A screening two-story colonnade runs around the rectangular forum, and large and small monuments were placed around its edges. The middle of the square was empty, to create the sense of a theater. ———– Basilica (X) – Temple of Apollo (XI) – Market building (XII). 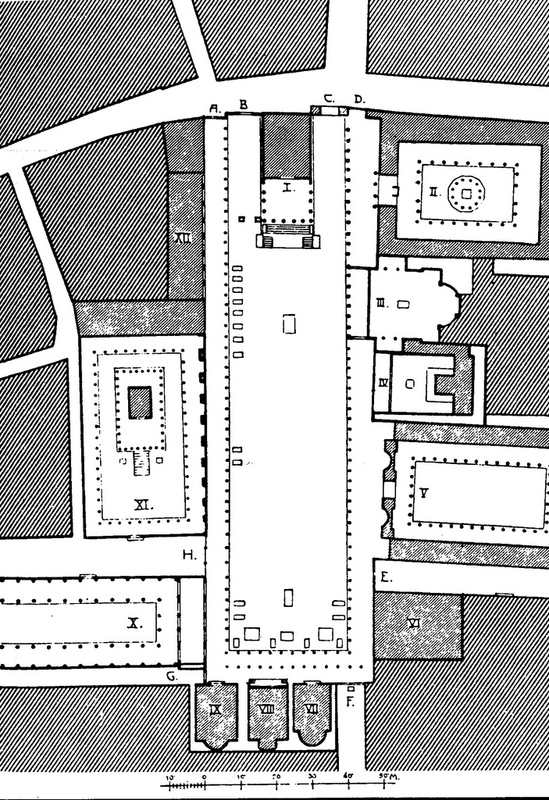 The layout of the Forum Romanum in Rome was based on the same principles, lined with monumental public buildings. The forum acted, just like in Pompeii, as a type of open-air theater. Monuments were not placed in the middle, but along the sides of the plaza undisturbed by the flow of traffic (fig. 705). Fig. 705 – A reconstruction of the Forum Romanum in the time of the Emperors, seen from the rostra of the Temple of Caesar. The relations between the open space of the plaza, the monuments, and the surrounding buildings were a matter of constant architectural attention. This holistic approach to city design remained until long after the Roman Empire had gone. It could be said ‘that in the Middle Ages and the Renaissance there still existed a vital and functional use of the town square for community life and also, in connection with this, a rapport between square and surrounding public buildings’ (COLLINS et al, 1986; p. 154). Camillo Sitte promoted in his book (Chapter III) a return to the enclosed public square and an irregular shape of the open space. He recognized a gradual development of the ‘historical’ (Italian) plazas, spaced out in time, which were in contrast to the planned, geometric divided areas of his own time. The Austrian reformer architect was strongly in favor of the irregular shape of the various plazas in Siena, Genoa and other Italian cities. He admired the historical and organic development of these public civic spaces, carved out in private city development. This observation was correct when Sitte made his remarks at the end of the nineteenth century, but it revealed nothing new. He would have concluded that this spirit of symmetry was hundreds of years old, if only he had gone to the S. Maria del Carignano in Genoa – ‘one of the handsomest churches in the world’ according to the Catholic Encyclopedia – and studied the ground plan of this sixteenth century church (fig. 706). Symmetrical designs might have been a hype in Sitte’s time, but they have been popular throughout the (architectural) history of mankind. Fig. 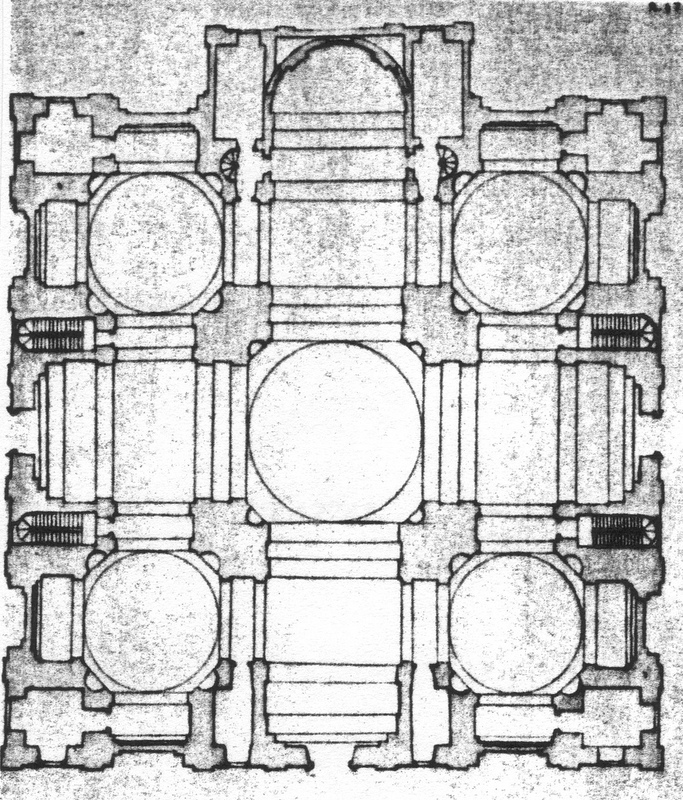 706 – The plan of the Basilica Santa Maria Assunta di Carignano in Genoa proves the point that symmetry had been an important issue for a long time. This church was designed by the architect Galeazzo Allessi, following Bramante and his design for the S. Peter in Rome. Building activities started in 1552, and the dome was raised in 1603. A renovation of the front took place in the nineteenth century by the architect Carlo Barabino. The proclamation of Sitte’s manifesto for the appreciation of ‘chaos’ in city development might be born in a spirit of oppositional thinking. His ‘war against symmetry’ was founded on the dual notion of the regular against the irregular. The valuation in this two-division was clear, declaring the regular as ‘bad’ and the irregular as ‘good’. This aspect should not overshadow Sitte’s book. His investigation of the historical meaning of the term ‘symmetry’ can also be explained as a further exploration in the world of higher division thinking. Camillo Sitte pointed out that the difference between the ‘classical’ (Greek and Latin) meaning of the word symmetria and its modern interpretation, as something with a mirror image likeness of right to left was significant. Vitruvius described symmetria as ‘a proper agreement between the members of the work itself, and a relation between the different parts and the whole scheme, in accordance with a certain part selected as standard’ (Book III, Chapter I). This approach includes not only the two-division (of the mirror-like image). It includes the graphic expressions of higher division-thinking, depending on the chosen standard. The quadralectic interpretation of aesthetic arrangements and the position of symmetry is given at the scheme on p. 393. The Piazza del Duomo in Pisa (fig. 707) was chosen by Sitte as a ‘master-piece of city building’ to prove his point. All the buildings of churchly art (the cathedral, the campanile, the baptistery, and the Campo Sancto) are joined together to hold the attention of the onlooker and produce an overpowering effect. The famous Leaning Tower (C in fig. 707) might even add a touch of unintended larkishness into the sublime spatial composition. Fig. 707 – The Piazza del Duomo in Pisa (Italy) is an example of a public square with an overwhelming influence of the surrounding buildings. The position of the buildings does not follow a distinct plan, and the distribution does not aim at any form of symmetry. John REPS (1965/1969; p. 25) distinguished two general types of squares. Firstly, the public square, like the Piazza di San Pietro in Rome and the Place de l’Etoile in Paris, which was designed to accommodate a great number of people and (traffic) movements. The second type of square was mainly developed in France and England and was the enclosed residential square, like the Place des Vosges in Paris. The emphasis of this latter type aimed at some form of privacy for the inhabitants of the buildings around the square. Arcaded sidewalks on the four sides catered for the pedestrian movement, while the central part often was left barren and used for public manifestations. It was only recently being planted with trees and flowers. The division of squares in large/public and small/enclosed segments is permitted as long as its limitations are realized. The Italian city of Lucca, for instance, was built on the remains of an amphitheater and its Piazza dell’Anfiteatro is in due course public, but also greatly enclosed (fig. 708). Fig. 708 – A view of the Tuscan city of Lucca (Italy) indicates the enclosed character of its main square, the Piazza dell’Anfiteatro. 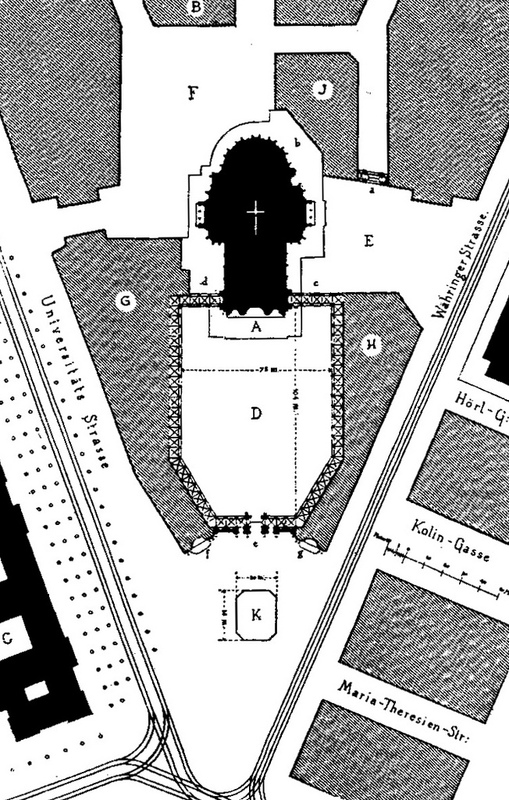 One of the most famous squares is the open area in front of the St Peter Church in Rome (see p. 278, fig. 217). 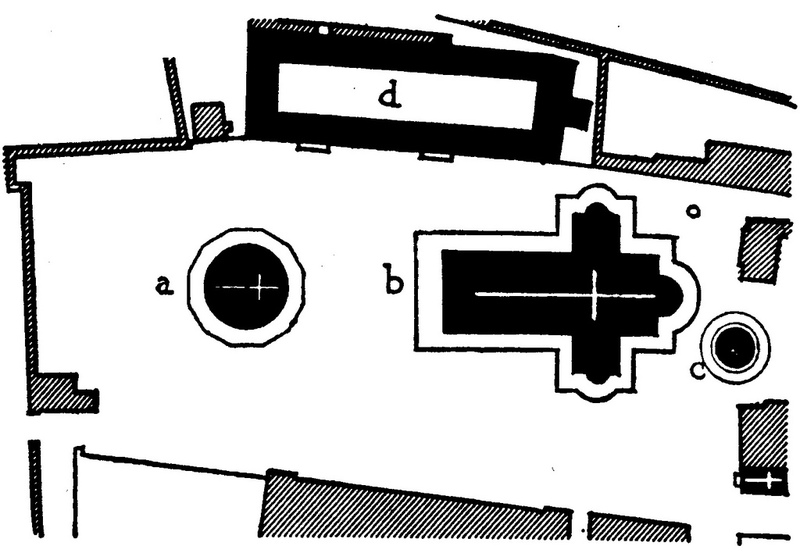 The improvement of the Piazza di San Pietro started as a project in 1659 and went through various stages of design, as is described by KITAO (1974) (fig. 709). Fig. 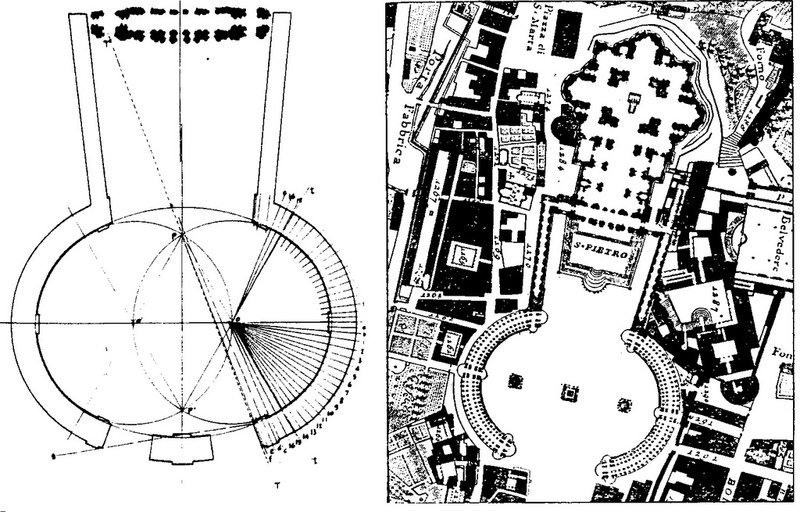 709 – The oval plan by Bernini, according to KITAO (1974) (left) and the Piazza San Pietro on Nolli’s map of Rome, 1748 (right). The history of the Capitol and the Piazza Campidoglio was extensively described by Harmen THIES (1982). He was concerned with the scientific bickering of the actual date of Michelangelo’s contribution of the design and proposed the year 1536/37. The trapezoid form, the facades, which did not face each other squarely and the ramped staircase called the ‘Cordonata’, posed difficult design circumstances. There was little room for a ‘perfect’ form. 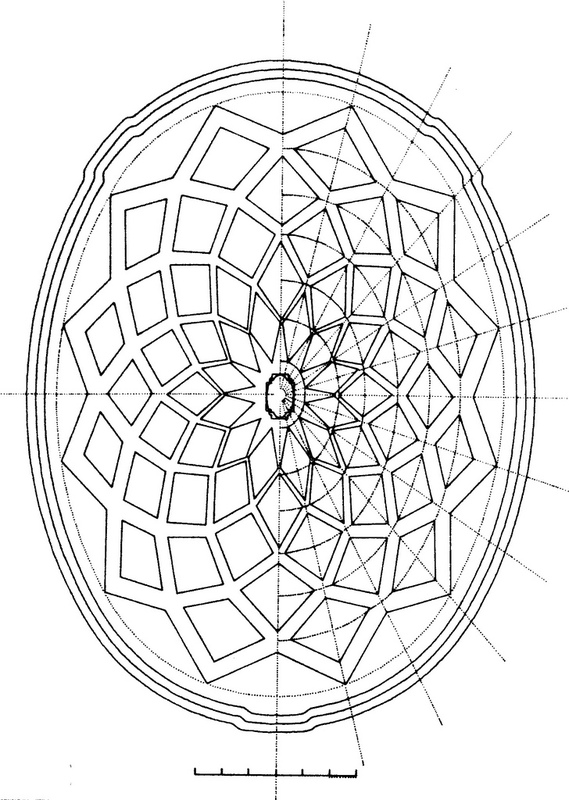 Michelangelo solved the problem with an egg-shaped square and a travertine design in the leveled pavement (fig. 710). Fig. 710 – Michelangelo created this revolutionary design of the egg-shaped Piazza Campidoglio in the years 1636/37. The plan was not executed, due to the death of Pope Paul III in 1649. In stead, some oval and circular designs with eighth spokes covered the piazza in the intermediate years until 1940. In that year Mussolini decided to recreate Michelangelo original design with twelve stars. The impression of Michelangelo’s sketch was of a twelve-pointed star, which could be a references to the constellations – and might therefore been rejected by the Popes. 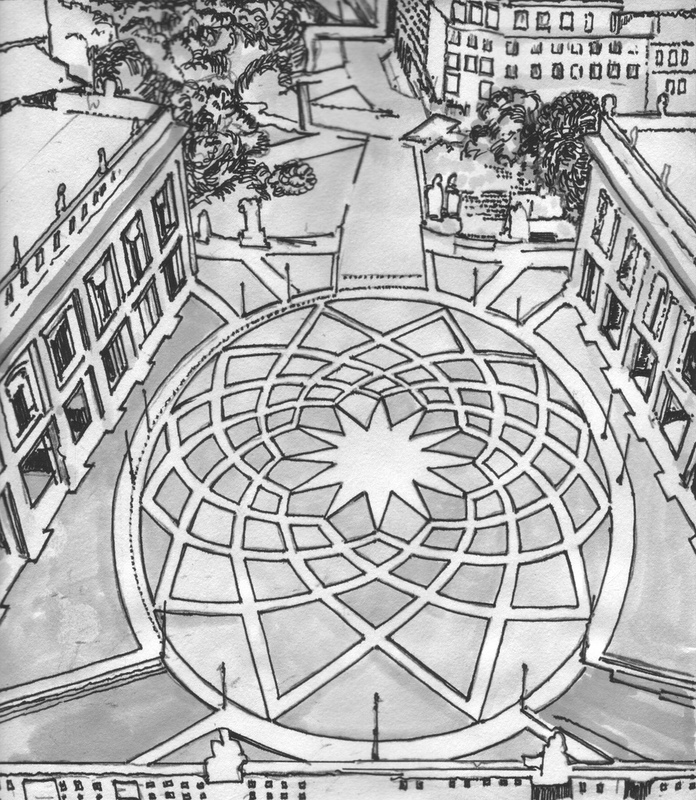 The Piazza Campidoglio consisted in the nineteenth century of an oval with eight spokes and later (in the early twentieth century of a circle with eight spokes. Benito Mussolini ordered the reconstruction along the lines of Michelangelo’s original intent, which was finished in 1940 (fig. 711). Fig. 711 – A view of the Piazza Campidoglio on the Mons Capitolinus in Rome with the restored pavement after a design by Michelangelo Buonarroti. The Mons Capitolinus was the smallest of the seven hills on which the city of Rome was built. The hill consisted of two elevations – the Capitolium and the Arx. The Temple of Jupiter Optimus Maximus was situated here in the old days (509 BC) and the place was also used as an asylum. On the south-western corner of the hill, overlooking the Forum Romanum was the Rupes Tarpeia, or Tarpeian rock, where traitors and criminals were hurled down. The monument with Emperor Marc Aurelius on horseback was brought from the Lateran Square to the Capitol in January 1538 and became the centre point of Michelangelo’s new vision of an oval plaza (THIES, 1982). Three palaces face the square: the central Palazzo Senatorio with stairs, the Palazzo dei Conservatori to the right and the Palazzo Nuovo (1603) to the left. An etching of the Capitol by Étienne Dupérac, dating from the year 1568, gives a perspective of the Capitol with the pavement pattern as intended by Michelangelo. The role of the square as a functional ‘power element’ in city development took a huge flight in the nineteenth century, with the (re) development of the city of Paris (France) as an outstanding example. Large parts of the French capital were demolished between 1853 and 1868. A complete new city design was superimposed on the old one, mainly under the guidance of the civic planner George-Eugène Hausmann (1809 – 1891). He was hired in 1853 by Napoleon III to ‘modernize’ the city and provide better traffic flow, improved housing and a higher sanitary standard. Streets should be ‘too broad for rebels to build barricades across them’. Wide, tree-lined boulevards and gardens replaced much of the old, small streets and rundown apartment houses. The Place de l’Etoile in Paris, at the end of the Avenue de Champs-Elysée, is a probably the apotheosis of this development and can still be regarded as one of the most impressive (although not the most beautiful) plaza’s in the world. Twelve streets intersect in a huge circular pattern (see fig. 451) and the traffic moves along the Arc de Triumph, which is situated in the middle of the circle. One of the largest squares of Paris is the Place de la Concorde, situated at the eastern end of the Champs-Élysées. The obelisk on the square was mentioned earlier (see Ch. 3.9.2) and is part of the ten original Egyptian obelisks scattered around the world. This particular obelisk once marked the entrance to the Temple in Luxor in 1300 BC. A pair of them was given to France in 1833, but only one could technically be managed in a position in the center of Place de la Concorde in 1836. The square was designed in 1755 by Ange-Jacques Gabriel (1698 – 1782) as an octagon between the Champs-Élysées to the west and the Tuileries Gardens to the east. It was then called the Place Louis XV, after the ruling king. Later it became the Place the Revolution and witnessed the execution by guillotine of some thirteen hundred people in the summer of 1794. Soon thereafter it was renamed Place de la Concorde under the Directory (1795-1799) in order to forget the atrocities of the French Revolution. 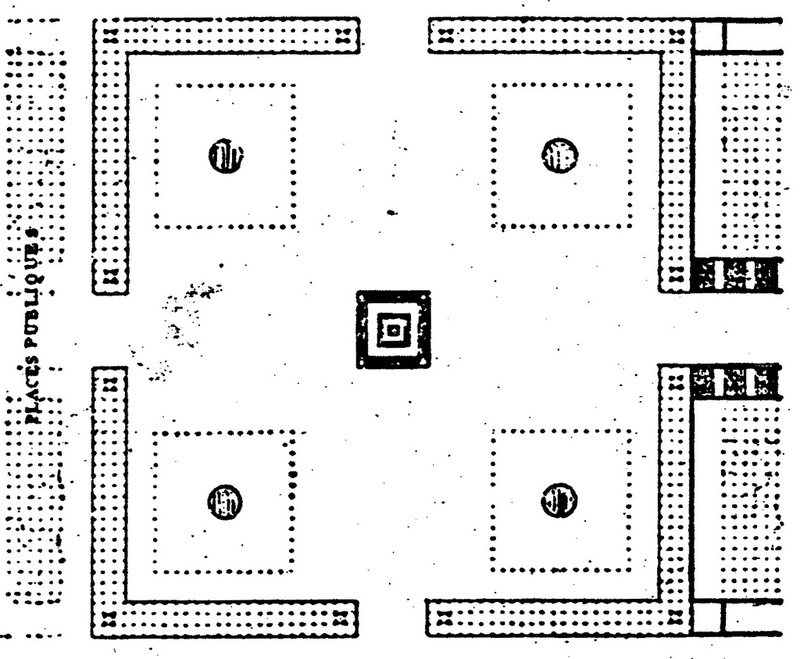 Later attention to the square included a design by Jean-Nicolas-Louis Durand, which was never accomplished (fig. 712). Fig. 712 – The Place de la Concorde in Paris after a design by Jean-Nicolas-Louis Durand. The residential square achieved a high order of development in London, starting in the seventeenth century. By the middle of the eighteenth century, the western portion of London had a dozen or more major squares. Maybe the best-known public gathering place in London is Trafalgar Square (fig. 713). It was constructed in the 1820s by the landscape architect John Nash and further developed and completed by Sir Charles Barry in 1845. Nelson’s Column is positioned in the centre and is guarded by four lion statues. The name of the square commemorates the Battle of Trafalgar in 1805, when the British Navy defeated a French and Spanish Navy in the Napoleonic Wars (1803 – 1815) off Cape Trafalgar in southwestern Spain. Fig. 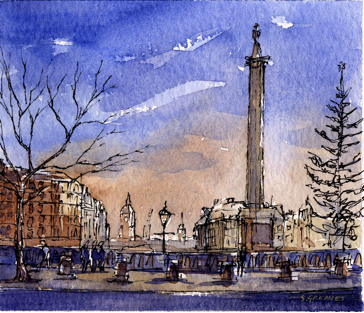 713 – Trafalgar Square in London, as seen in this watercolor by Steve Greaves, is probably the most famous square in the heart of London.The history of the square is linked with the Charing Cross. The original Eleanor Cross stood at the top of Whitehall to the south side of Trafalgar Square, but was destroyed in 1647 and replaced by an equestrian statue of Charles I in 1675. 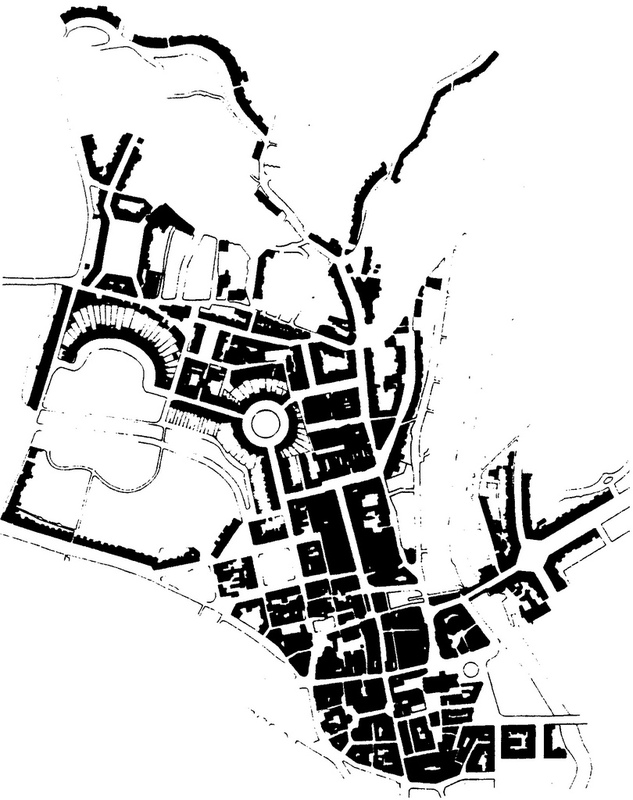 The city of Bath (England) paid much attention to a planned urban layout at the end of the eighteenth century under the direction of John Wood the Elder (1704 – 1754) and his son, John Wood the Younger (1728 – 1782). The Circus (designed by the former and completed by the latter in 1764) and Royal Crescent (1769) in Bath have a distinct geometrical clarity, which was inspired by occult and Masonic symbolism (fig. 714). Fig. 714 – The urban extensions of the city of Bath (England) is an example of a functional use of open space, using the natural contours as a guideline. The Circus is the enclosed circle in the middle of the plan. The Royal Crescent is an open elliptical arc to the left, while Lansdowne Crescent is the serpentine shape at the north-western part of the map. Many places in Germany at the end of the eighteenth century had their attention focused on the city square (or market place) in the center of the towns and cities. Only one city (Karlsruhe) will be mentioned here, since it shows vividly the general trend towards the symbolism of the heart of the city, but many cities in Germany and the surrounding countries followed the same approach. Karlsruhe had been a ‘design’ city or ‘fan’ city (Fächer-stadt) from the time when the Karlsruher Schloss (Palace) was erected in 1715 by Margrave Karl Wilhelm of Baden-Durlach. 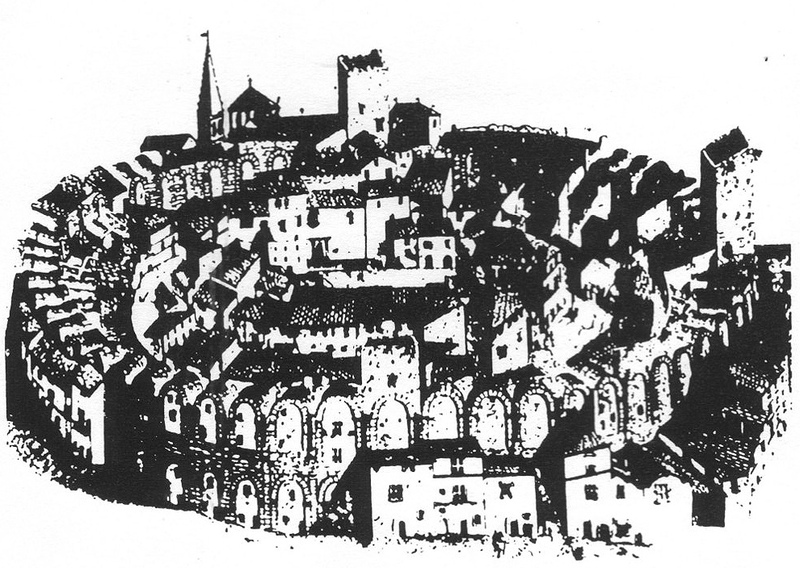 The city was planned with the tower of the palace at the centre and thirty-two streets radiating out from it like a folding fan (see also fig. 811). The attention shifted at the late eighteenth century/early nineteenth century towards the development of the market place under the guidance of the architect Friedrich Weinbrenner (LANKHEIT, 1979)(fig. 715). Fig. 715 – The Market Square (Marktplatz) of the German city of Karlsruhe as envisaged by the architect Friedrich Weinbrenner (1766 – 1826) in 1818. The pyramid was placed over the tomb of Markgraf Karl Wilhelm von Baden-Durlach (1679 – 1738), who was buried in the (demolished) Konkordienkirche. The structure was first provisionary executed in wood, but replaced between 1823-1825 by the present stone pyramid. The ‘Via Triumphalis 2022’ is the latest addition (1997) to Karlsruhe’s history of planned urbanism. A line from the Karlsruher Castle (Schlossplatz), over the Platz der Grundrechte and the Marktplatz with the pyramid, follows the Karl-Friedrich Strasse to the Ettlinger Tor Platz and further along the Ettlinger Strasse. This idea of a straight line is classical inspired and fits in the psychology of linear thinking – and subsequent dualistic tendencies – rather than in ideas about an equal distribution in a four-fold environment. Paul ZUCKER (1959) in his book ‘Town and Square: From the Agora to the Village Green’ gave a brilliant overview of the development of the city square as a ‘psychologically determined archetype of universal relevance at every stage of development and every scale of settlement’ (MOCLUS; GUARDIA i BASSOLS & GUÀRDIA, 2006). It would be outside the scope of this book to give further examples of city squares from other places of the world, so we have to leave Time Square in New York, Tiananmen Square in Beijing and Commercial Square (Raffles Place) in Singapore for what they are: a focus point of human communication. It might be sufficient to conclude here, like Paul Zucker did before, that the square is an important element in urban design. Its force lies in the representation of the ‘empty space’ in a quadralectic communication. Any square is a reminder to the First Quadrant – the realm of the invisible invisibility and the world of intuition.